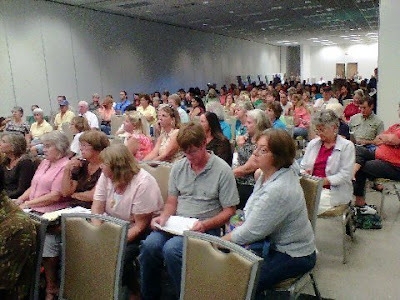 For the second time this summer, officials had to move the venue to a larger place when public response to their proposals exceeded expectations. And who do you think is sitting in the very front of this hall? Well, I'll tell you. FNPS members. I can see at least three members of the Florida Native Plant Society who sacrificed personal plans to make the trip over to Plant City for the hearing this afternoon. You can bet they were there early and had their comment cards filled out. Front row, on the left, is Annie Schmidt, the Society's Conservation Chair, Daphne Lambright, Treasurer, Anne Cox, Chair of the Land Management Partners Committee, and to Anne's left, Katy Roberts, from the FNPS Pinellas Chapter. I have just learned now, (Saturday night) that FNPS member Brooke Martin, not in photo, was present and spoke on conservation considerations at the hearing. Kudos to all for putting your beliefs into action. Monarch butterfly populations are declining, in part due to declining milkweed populationsFew commercial sources for milkweed seed are available for the Southeastern regionsTheXerces Society has funding to increase seed sources, and is collecting seed nowThe seed of the aquatic milkweed,Asclepias perennisis scarce this year, and they are seeking our help in locating and collecting seed from this plantCommonly called 'swamp milkweed' or 'aquatic milkweed,' A. perennis can be found in a variety of wetland habitats, from swamps to roadside swales. It flowers more freely in sunny locations, but tolerates semi-shaded spots as well. The leaves are bright green and lance-shaped and opposite, the height no more than two feet. 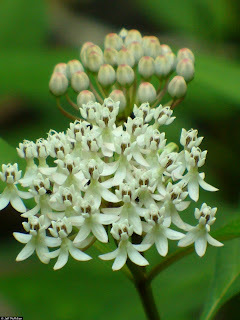 The white flowers are sometimes tinged with pink. The species is currently flowering and producing fruit. I wish I could draw. This is what most people tell me when they avoid putting pencil to paper. My answer? You can, but your expectations are in the way. Too often we focus on the product – what we want to create. Our culture values the end result: the finished item, the goal reached, the happy ending. Think instead, about the process of drawing. A few pencil marks can reflect an observation and a connection. 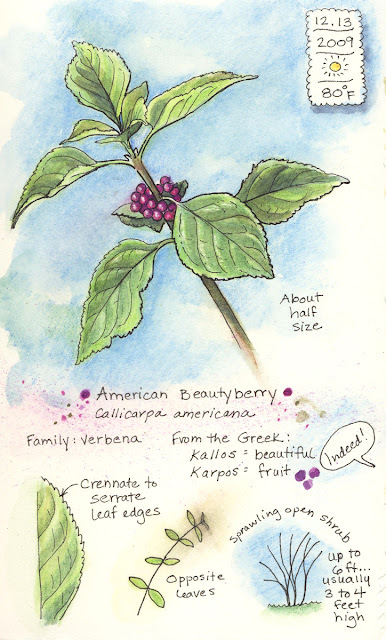 For me, the process of keeping a visual journal is a pathway. Every time I sketch something, I create a new connection to nature; I get to know my subject on an intimate level, I ask questions, I reflect, I explore. Renee Stambaugh has organized a series of classes on native plants in St. Augustine. She decided there was a need because at her speaking engagements, she could see the crowds and the crowds themselves growing. At the annual Flower and Garden Show at the agricultural center in April, where the crowds were the largest, she decided that a series of classes just covering native plants could work. She was right--her first class in June attracted 120 people on a Thursday afternoon! She engaged three other speakers and secured a room at the St. Johns County Agricultural Center (out near Rt. 95--nearly nine miles from St. Augustine's town center), and began the publicity. Two of the speakers (Gail Compton and Keith Fuller) write regular columns for the local paper, so they both gave the class coverage. Plum Delicious and Native, Too! The tart edible fruits of Prunus angustifolia and Prunus umbellata are ripe and ready for wild foraging. P. angustifolia, commonly called “Chickasaw” plum after the native people that favored their use (Austin), and P. umbellata, known as “flatwoods plum” are members of the Rosaceae family. Most people are familiar with the spring bloom of white flowers that form before the leaves, offering one of the earliest floral displays after the winter frosts in north Florida. The prolific trees and shrubs of the Prunus genus were widely used by native people for everything from medicines and food to wood products and ceremonial objects. More than 400 species can be found throughout the United States, Europe, and China; there are two native species in Africa. The genus includes plums, cherries, peaches, apricots, and almonds. The Prunus species native to north central Florida grow in woodlands, flatwoods, along roadsides and fence rows, and in open pine areas. Here is a landscape that is an award winner in so many ways! 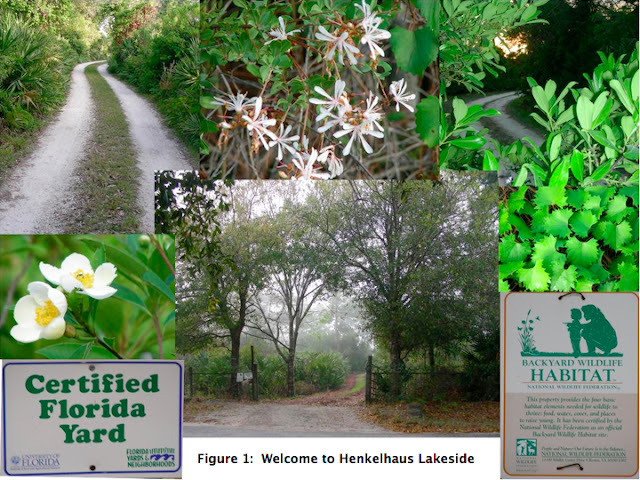 John and Nancy Henkelman received this year's Award of Excellence in the Residential-Amateur/Homeowner division from the Florida Native Plant Society at the Annual Conference this May. From the very beginning of their adventure in landscaping, the Henkelmans knew they wanted to be able to share their home with friends, Boy Scouts, and garden lovers of many kinds. They wanted to provide space for the Scouting activities of their three sons, and they wanted as much habitat as possible for wildlife. They worked over many years to protect and maintain the existing scrub, wetland and lakefront ecosystems on their land, while building a home and striving to to showcase the beauty of wild and natural Florida. The prospect of adding 45 camping spots at Honeywell Island State Park in Dunedin—including spaces for RVs—drew several hundred boisterous opponents to the plan. 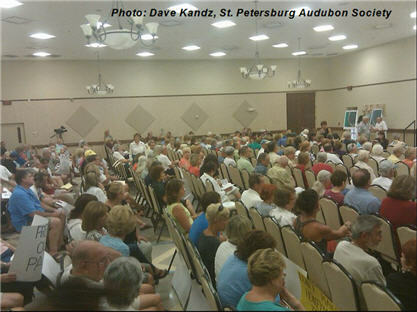 Originally the meeting was to have been held at the Dunedin Library, but as word spread throughout the community, the city and the Florida Park Service (FPS) scrambled to find a space that would accommodate a larger group. 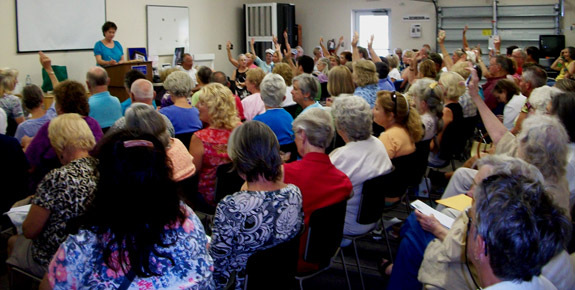 The crowd that turned out at the Hale Senior Activity Center filled the auditorium, an adjacent room, the foyer, and spilled out into the parking lot. It included local residents, park volunteers, city officials, legislators, and environmental activists. Perhaps they should have booked the Blue Jays stadium across the street!